As Previously mentioned Blogger New Interface Upgraded - Why to Switch - Old interface Retiring and as seen on Blogger Buzz its looking quite obvious that soon we have to say good bye to Blogger older interface as Blogger has developed a newer and more improved interface with latest technology.When Blogger New interface was introduced it was full of bugs but now its fully optimized with new and improved features which is the biggest reason why its time for older interface to get retired.This post is based on Bloggers latest update about retiring older interface. 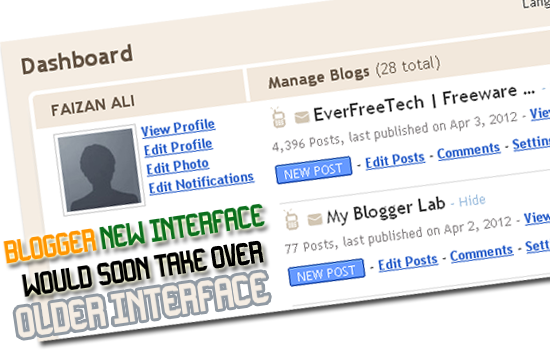 In coming weeks,for those who are still using blogger older interface they will automatically switched to Blogger New interface as it will become the default interface for blogger,and this will brought lots of advantages to you in form of new and upgraded blogger tools,if you are already switched to Newer interface,then there will be no change to you. 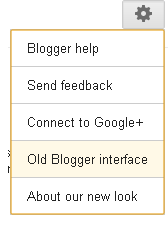 After the upgrading you can still temporarily switch back to older interface,by going to Blogger Options >> Older Blogger Interface there is a link located in setting but it is not for long period of time as blogger older interface is on its way to retirement. Here look at the Blogger New interface Promotional Video,with latest features and an introduction to blogger new interface.